St. Edward the Confessor, King of England, 1066. THE history books will not tell you very much about Edward the king; for he was not a great ruler like Alfred or Edgar. It was the confessor, not the king, that the English folk remembered, when in after years they looked back from the hard rule of the Normans to the days of St. Edward, whom they loved to call the "blithe" and "debonnair." Edward the Confessor was the last Saxon who sat upon the throne of England. He was a gentle, kind, pious man, who seemed the more gentle and kind in contrast with the fierce kings and earls of the time He was on the throne for twenty-four years, and during that time Earl Godwin and his son Harold after him, managed the affairs of England. The stories that have come down to us about the Confessor are mostly legends, and some of them I shall now tell you, because they really help us to understand Edward and his times better than any history books. Edward's mother dedicated him to God at the altar of Ely Monastery when he was a little baby; and at Ely School he learnt, as he grew up, to sing the psalms in church. But after a while the tyranny of the Danes forced the mother to flee with her son to Normandy. There in a foreign court Edward grew up, and lived thus, more as a Norman than an Englishman, till he was forty years old. Then a great change came over England. The Danish king, Hardicanute, who was ruling the land, died; and the people longed to fill his place with a true-born Englishman, as in olden times. 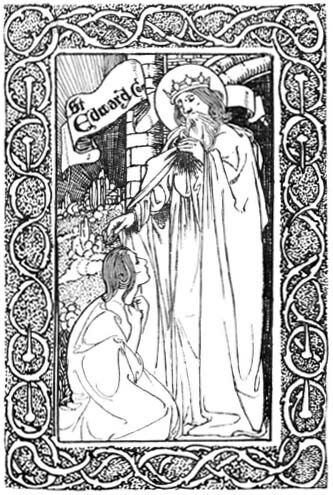 When Edward heard of the wish of the English people he was unhappy; for he wanted to spend all his life in prayer and meditation. But at last Earl Godwin went over with an embassy to Normandy, and persuaded him to come back to England and be crowned. So in the year 1043, the old chronicle tells us, "all folk chose Edward and received him as king"; and he was crowned at Winchester by the Archbishops with great festivities. He received many presents at his coronation, but the most wonderful was that of Earl Godwin. It was a great warship, rowed by two hundred men: a golden lion stood at the stern, and at the prow fluttered the brilliant national ensign, the Dragon of Wessex with its golden wings outspread. Inside the ship was a purple tapestry on which were pictured the great sea-fights of the Saxon kings. All the people were astonished at the noble aspect of the new king. Although he was not an old man, his beard was white, and long white hair fell on to his shoulders. His eyes were blue, his lace plump and ruddy, and his hands white and small. How different he was from the cruel, vicious Hardicanute! When he began to reign, his people noticed that, though he was majestic in public, he was sociable in private life and kind to everybody. But his virtue surprised them even more; and there are two stories told of him which show how indifferent he was to earthly gain, and how much he hated avarice. The Story of the Danegeld. He had not been king long, when his treasurer, hoping to please him, took him to the royal vaults, and there showed him the great barrels of money which had been extorted from the people by that tax called the Danegeld, which had become an unjust tax now that there were no Danes. But when King Edward looked at the barrels in the dark vault, lo! on the topmost one he saw a black and hideous devil sitting. So he ordered that the unjust tax should be collected no more; and thus a great burden was taken away from the people. The Story of the Thief. One day King Edward lay on his couch, troubled with much thought, and unable to sleep. As he lay there, Hugolin, the treasurer, came in for some money; he walked to the chest in the corner of the room, and, when he had taken the money, he went out, but forgot to lock up the chest. After a while a scullion crept up from the kitchen, and peeped in. The sunlight fell across the quiet room, and at the further side the king lay quite still under the curtains that hung across his couch. So the scullion made sure he was fast asleep, and glided in, like a shadow, to the chest; then he took a handful of silver and slipped out as he had come. A second time the scullion came in and stole a second handful of money, and still the king lay without moving, watching the thief quietly all the while. But the foolish scullion stole in a third time, and once more plunged his hand into the chest. Then the king could bear it no longer, and sprang from his couch. Down upon his knees fell the wretched thief in his terror. But what was his amazement when the king said to him in his kind way,--"Fly, fellow! for well I know that Hugolin is coming back. By the Mother of God, assuredly he will not leave you even a halfpenny! What you have already taken keep in peace. I will not discover you." In a few minutes back came Hugolin, the treasurer. "Harro!" he cried, when he saw the open chest. "Did you not see the thief, sire?" The king made answer:--"Hugolin, no! It was a poor needy one. He has more want of it than we. Enough treasure has King Edward! As Jesus Christ teaches us, common ought to be worldly property to all those who have need of it." When he had been king two years, Edward married the Lady Edith, Earl Godwin's beautiful daughter. At the wedding the nation kept high festival; knights shivered their lances against each other; youths sang, and played the harp and fiddle, and the ladies danced with them in their beautiful dresses of silk and jewels of gold. But the mild king cared little for all these things. He ate sparingly at the great feasts, and he wore without thought the rich robes that his young wife had worked for him; for his heart was set upon other matters. After a while he announced to the Wise Men of the kingdom that he intended to go on a pilgrimage to the tomb of St. Peter, his patron saint, at Rome. The idea had come to him one day, a long while ago, when he had gone into a church, very sad at heart, to pray; before he rose from his knees he had vowed to Almighty God, and to Mary John, and Peter that he would make this pilgrimage. The Wise Men were in a great fright when they heard of this. They implored the king to remember all the dangers from sea and robbers and mountain-passes which lay before him; for, if he were to die, the kingdom would come to naught. But Edward replied that he had made a vow, and could not break it. At last an old hermit helped them out of the difficulty. This hermit was a very saintly man who lived in a hole in the rocks, and eat nothing but roots and fruit. One day he had a vision, in which St. Peter appeared to him and said he would release the king from his vow, if, instead of going on a pilgrimage, he would build a great church at London in honour of St. Peter. Edward chose for the new church the island of Thorney, beyond the western gate of London, because there was an old monastery there. First, he rebuilt the monastery; and, when, after ten years, that part was finished, he pressed on with the church, giving a tenth of all his possessions to the building. It was the great work of his life; and St. Edward has ever since been remembered as the king who founded the great church which we now call Westminster Abbey. As each year passed, the new minster rose higher and higher, and Edward grew stronger in his holiness. He was now becoming an old man, and so good was he that he was given power to heal the sick and blind. Once, we are told, an Irish leper came to the palace which Edward had built near the minster. The poor man was so deformed that he had to drag himself along on a stool--a loathsome sight, covered with terrible sores. "Help me, Hugolin!" he cried. "St. Peter has promised to cure me, if only the king will carry me from here to the monastery." Hugolin went to the king and told him of the strange request. "But the man is in so horrible a state," said he, "that no one can touch him." The king answered, "I will do it, by my Faith! I thank God that He has chosen me for such an office." So he went to the leper, took him in his arms, and carried him across to the monastery, though the poor wretch's body soiled his royal robes. When the leper was set down by the altar he found himself healed; and he set up his stool in the chapel as a memorial of the miracle. The Legend of the Ring. One day, another legend says, the old king was attending the dedication of a church in honour of St. John, when a poor man came up to him, and begged an alms "for the love of St. John." St. Edward put his hand to his purse, but neither silver nor gold could he find. He sent for his almoner, but he was lost in the crowd; and still the poor man stood before him and begged. Edward was in great distress, till he remembered that he wore a large and very precious ring. This he drew from his finger; and for the love of St. John he gave it to the beggar, who thanked him gently, and disappeared. And now you shall hear what happened to the ring. That night, far away in Palestine, two English pilgrims lost their way in the wilderness. The sun had set behind the bare mountains, and the two men were all alone in the desolate place, knowing not which way to turn, nor where to find shelter from robbers and wild beasts. As they were wondering what to do, a band of youths in bright raiment appeared before them; and in their midst was an old man, white and hoary, and wonderful to look upon. "Dear friends," he said to the pilgrims, "Whence come you? Of what creed and birth are you? Of what kingdom and king? What seek you here?" "We are Christians, and from England. We have come to expiate our sins, seeking the holy places where Jesus lived and died. Our king is named Edward; and we have lost our way." "Come after me, and I will conduct you to a good hostelry for the love of King Edward." So he led them to a city, where they found an inn with the table laid for supper; and, after they had eaten, they went to rest. Next morning the old man came to them, and said: "I am John the Evangelist. For the love of Edward I will not fail you, and you shall arrive safe and sound in England. Then go to Edward, and say you have brought a ring which he gave to me at the dedication of my church, when I besought him in poor array. And tell him that in six months he shall come to me in Paradise." The pilgrims came back to England without misadventure, and gave the ring back to Edward with St. John's message. When the king heard that he was soon to die, he gave away all his money to those who were in need, and passed his time in devotion. And now he hurried on with the building of the great church at Westminster, hoping to get it finished before he died. On Holy Innocents' Day it was ready for consecration, but Edward lay on his death-bed in the palace hard by, and could not take part in the service. When they came to tell him the service was over, he knew that his last hour was come. "Dear loyal friends," he said to those who stood sorrowing round his bed: "It is folly to lament; for this is God's will." And when the Lady Edith threw her arms round him, and sobbed on his breast, he smiled at her in his gentle way. "Weep not, dear one, grieve not for my death. For I am going where I shall be always in joy and happiness." So the first royal funeral in Westminster Abbey was that of Edward the Confessor, who had built it. Ever since, the kings and queens of England have been buried there; but when you go to the Abbey, you can still see behind the high altar the tomb of our last Saxon king.